Another session of perfect conditions at Sky Pilot today and the moves have been done on the big highball. Still thinking it’ll be a V14 with 10 moves of about V10 to the crux and then the big move. This progress seems like a fine excuse to abuse the training board extra hard over the the coming weeks and really go in for a good battle on this project. I definitely don't have my bouldering 'snap' back just yet after the summer of getting fit at hanging about on multipitch staminafests and walking back and forth across moors on Orkney. I finished the session dripping with blood from the hand after slicing my little finger open good style on a blade of grass. Yes you read that right. Thats what I get for throwing caution to the wind and pulling out a few clumps of greenery from the sit start footholds without a stout pair of gloves on. In recent weeks, climbing has seemed just about the safest part of going climbing. 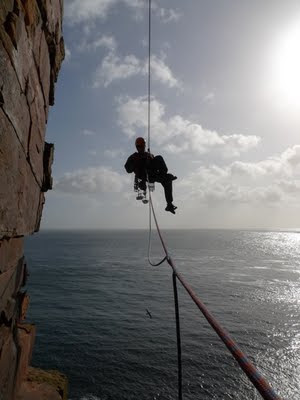 I’m talking at various places soon if you’d like to listen to some perspectives on climbing, trying hard, choosing your battles, if succeeding on projects is really important or always worth the sacrifices and other things such as negotiating with local wildlife make progress on E11s. First up I’m talking on Sunday night of the Edinburgh Mountain Film Festival on Oct 18th. Tickets are on sale now and more details about the festival lineup are on the EMFF site. Soon after I’m in Dundee helping Tiso celebrate 20 years in Dundee. Full details of this on the Tiso site here. I’ll show you some nice pieces of video of some of my best climbing efforts recently and hopefully make you see aspects of your climbing in slightly different light, as I have in the past 12 months. 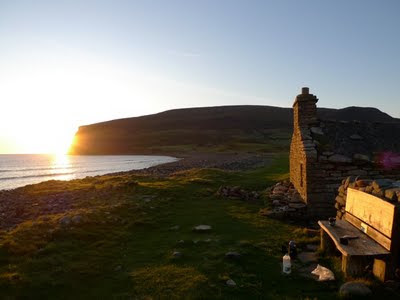 A nice evening at Rackwick Bothy as we arrived… too late. 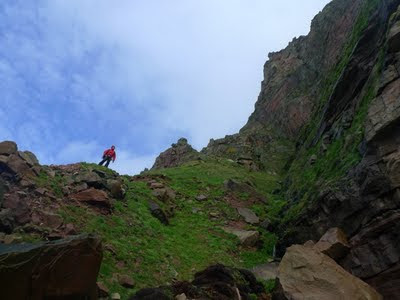 Blair struggles to get his gear out of his rucksack without it blowing to Norway at the top of Mucklehouse Wall. 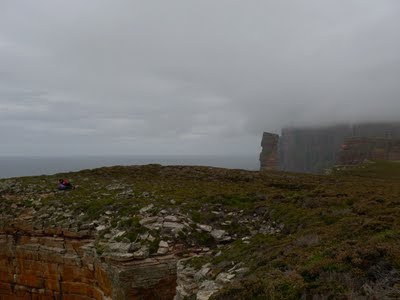 The top of the old man of Hoy and most of St John’s Head behind in the cloud. "Just realising how much of a problem I have staying relaxed a lot of the time. I'm sat here in a beautiful evening in Rackwick with nothing to do except enjoy the moment, but all I can do I worry that tomorrows forecast is bad and how poor our chances are of getting a shot at the longhope route, never mind getting to the top. 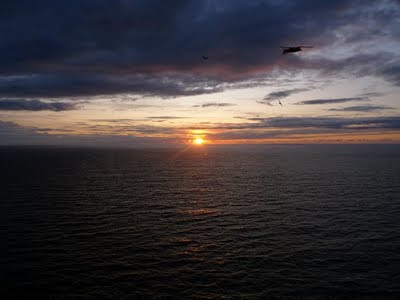 on nights like tonight is just as bad as getting to the crux move and giving in at the discomfort of the hard effort..."
...I wrote the above words on my phone on while watching that nice sunset after arriving on Hoy with Blair and Cubby. As you can see I’d done a reasonable job of feeling positive despite the forecast telling us everywhere in the UK would be enjoying the September High pressure except us with a windy, drizzly cold front on it’s periphery. 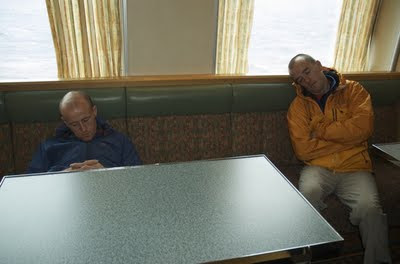 Perhaps we could have awoken to decent conditions and a successful day. But as it turned out we woke at 4am to the sound of thundering waves and drizzle. chattering of teeth in the cold gale. As soon as got back onto the Scottish mainland and back underneath the high pressure, we drove past flat calm shores and through warm sunny hills to get back to Lochaber for work. It felt just a bit cruel I must say. So much as I hate to say it, thats probably the lasthope for longhope this year. 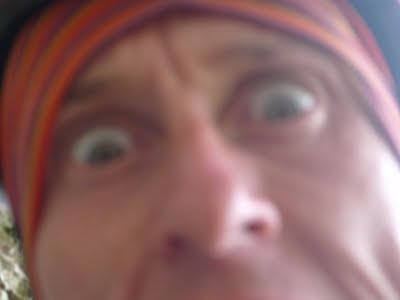 Sure I could go back armed with more gear to keep us warm and dry on the wall for a forced bigwall style autumn ascent. But my goal from the start has been to climb this route in a single day push. And with the 18th pitch being E10 it’s not going to happen unless we are moving super fast and light. But sudden freedom to make other moves on rock has been only a temporary downer. Sessions on the two big bouldering projects in Glen Nevis have underlined my wee strength increases from the new training facility. I managed two whole foot moves more than before on the Font 8c project thats featured in the committed II film. I’m even more excited about the bigfoot project which narrowly escaped all it’s individual moves being completed yesterday. 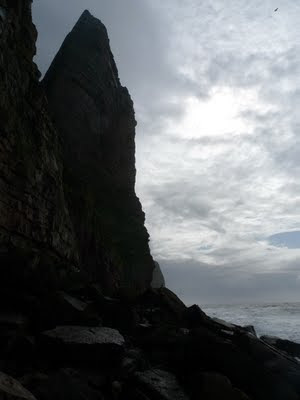 I forgot how gratifyingly convenient bouldering is compared to bigwall trad dirty, birdy, turfy, soft, loose E11 sea cliffs in the windiest place on the goddam planet. A mention goes to Kev for a one handed and helmetless ascent of Firestone E7 the other day. Nutter. 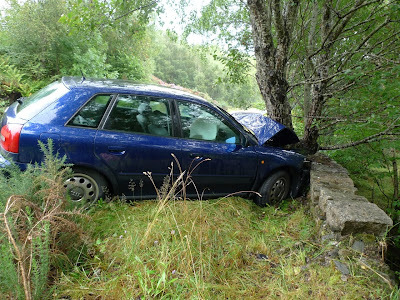 The west highlands almost lost two of it’s MacLeod’s to the A86 on Saturday morning after Claire wrapped her nice Audi around a tree. I was sitting in the passenger seat and believe it or not I was happy it was a direct head on hit on the tree, because if not it would have been over a retaining wall with a probably terminal drop on the other side. A very wet road, a little too much speed for the bend, and a little touch of the brakes on the cusp of the bend were the combination of causes. 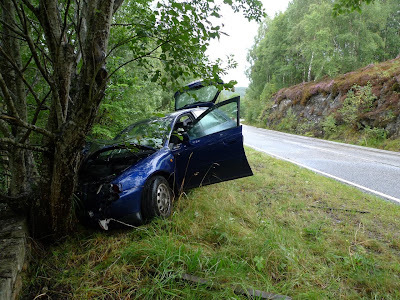 The back of the car slid, followed by wild veering and steering, and the next thing we saw in the windscreen was a large tree. We had a split second to either tense or relax in preparation for the big smash. It felt a little surreal stepping out of a completely re-shaped car, with only a sore neck and the odd scuff between us. The split second after the impact of turning to Claire to see if she was still with me was not something I’ll forget in a hurry. Thankfully she was looking back at me and immediately agreeable to getting out of the car. Apologies to my climbing masterclass students who had a bit of a wait for me to arrive and a slightly frazzled coach once I finally did. Kudos to Mr Gardner for being on the money that there are often more pressing things worth worrying about than falling off rock climbs, terrorists and nasty flu viruses. It’s been another journey of big ups and downs on Orkney over the past few days with Micheal. But every time I have a fantastic trip, regardless of results. 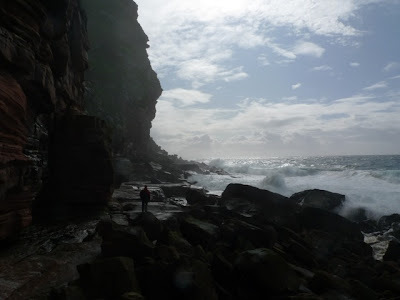 Duly, the wind prevented us from even getting to the edge of the cliff when we arrived, but spending the day soaking up the atlantic ferocity provided much amazement at the forces of nature on display on this island. St john’s looking nearly as big and mean as it actually is. So with conditions near the top of the wall too extreme, we tried playing on the bottom, and between the rain, we sussed out some of the lower pitches. 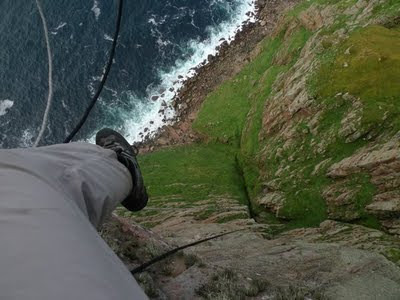 We had a good day climbing about halfway up the wall, but fairly cumbersomely, equipped with big wet boots to get through pitches of soaking off-vertical grass pitches and wearing our Gore-Tex’s to keep out the rain and fulmar hurl. I felt pretty down about the whole thing one morning. 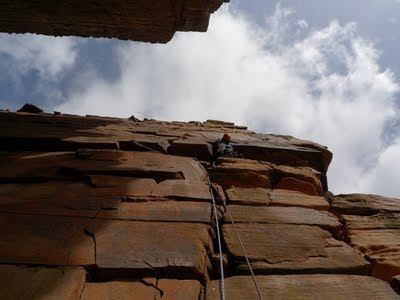 On the one day we could go on the crux pitch from the top, the dampness in the sandstone meant I pulled three small but important holds off the crux pitch. It was all seeming a bit too tenuous a goal to climb such a hard pitch here, with conditions against us and soft, rock, angry wildlife and without the previous 17 pitches using up precious energy for the big pitch. At these times, realising it’s not going to ‘go’ this trip, or even next trip, it’s hard not to let frustration reach the surface. Frustration with myself that is. On one hand I understand that I am not here for an easy route. In fact, if it just happened and was an E10 I’d probably be even a little disappointed it wasn’t harder. But on the other, I’m here to climb and to chase after that feeling of a hard climb feeling effortless. But all I seem to be doing is walking back and forth across that heather bog day after day in the rain and gale. I found myself if the messed up position of being on a climbing trip to an amazing place, but dreaming of my three metre high board at home. Thankfully such madness was only temporary. Michael descending the jurassic park slopes to the base of the cliff. I decided to use a highly dynamic technique for the last 30 feet of this, shredding my Gore-Tex nicely. Just to have been to the outstandingly beautiful place that lies remote from the reach of most people at the base of St John’s Head made this trip worth it. The fulmar chicks are just getting to flying school age now, and we witnessed several amusing ‘baptism of fire’ first flights and semi-falling descents of St John’s Head from young flyers. Not all of them learned quickly enough as the above demonstrates. 1200 feet of air beneath the feet. Doesn’t seem real. The best part about trying something completely different like this climb is realising how completely rubbish you are at the weak areas of your game. I always get climbing logistics quite spectacularly wrong. This trip was not different, with some impressive errors that seem so silly in hindsight, and a few I’ll forgive myself for needing to learn the hard way. But they are learned, and I have knowledge for next time, whenever that will be? 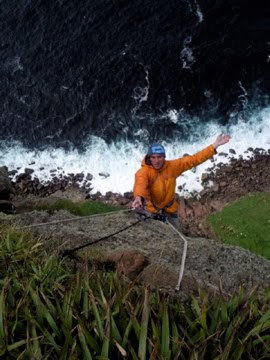 My recent travails on the massive lump of sandstone that makes the towering St John's Head brought home an important truth about climbing for me; so many varied things are involved in the enjoyment of rock climbing, and of these, friction is an extremely important one. I spend a lot of time in my work related to climbing trying to explain in detail climbing's attractions. Yet it still seems impressively resistant to being encapsulated by any single idea or perspective. That in itself might be an appealing idea (for another day). The breadth of dimensions in which climbers find satisfaction through their activity keeps surprising me to this day. But perhaps inevitably only a few are commonly talked about. Very fashionable again right now is the visual dimension of the 'king line'. If the climb looks amazing then it's worthwhile. The length of the climb has always been another popular measure of quality or stature in climbs, even despite bouldering and sport climbing becoming so big in the last couple of decades. 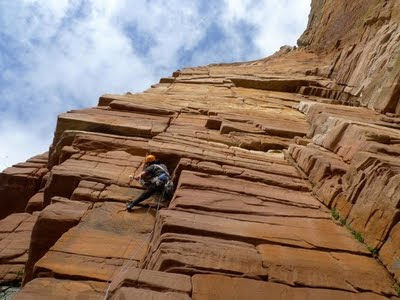 But the actual interaction with the rock climbed is only often referred to in the context of the texture and shapes of different rock types and their merits. 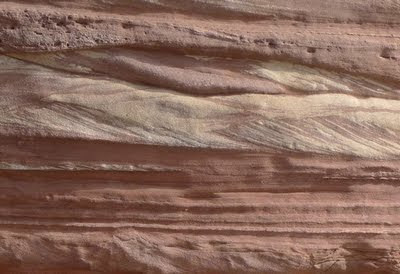 Through the medium of the activity of rock climbing, the various rocks on show around the planet can really be appreciated as quite amazing and beautiful stuff. But perhaps still in a way thats hard to put into words, a problem I'm sure geologists must surely share. Andy Kirkpatrick often laments in his lectures that even talking about the actual climbing activity is boring. True, it might not be a bountiful source of entertainment for telling climbing stories. But if the raw feeling of climbing rock brings on a magic sparked feeling of pure satisfaction even if only for elusive moments, then it's worth a more involved look. Understanding it fully might be too lofty a goal even for a whole lifetime of climbing rocks. It was while climbing some god-awful, chossy vertical sand with the consistency of sugared pastry on Longhope that a previously subconscious appreciation of rock friction suddenly became stronger than ever. The feeling of improbable weightlessness caused when just the correct atmospheric conditions combine on pristine rock for an ethereal moment is something desperately hard to relate, but instantly recognisable to those who’ve tried climbs near enough their own limit to experience it. Two moments stand out - one was the weirdness of the ‘sticky-damp’ at Stoney Middleton on a misty, dank and humid day. Without any warning (i.e. Climbing like a potato just hours before) I flashed an apparently wet V10 without any effort, but half an hour later the weather changed and I couldn’t touch it despite it actually drying up! 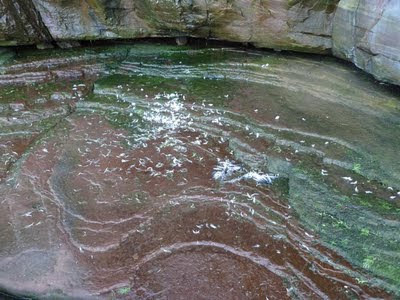 Another was on Rhapsody after a raging September squall had soaked and cooled the rock and rapid-dried it in a 60mph wind. I still fell off, but quite possibly I think I lost my concentration because I was trying to understand how all the holds suddenly felt so much better! Both experiences lasted only moments and neither were particularly memorable in other ways, but they obviously remained strong in the memory for a reason. So the other day on Longhope I was cursing the complete absence of any frictional properties of this section of diabolical rock. So how then does it follow that I still enjoyed the climbing here? My second realisation in this moment was that only because the friction was so frighteningly absent, that the subtle balance required to move between the holds was so much sweeter to experience. The message of this post? Whatever rock you always climb, think of the exact opposite, and go and climb some of that for a bit. The very aspects you might hate about it might well reveal something even stronger to enjoy.